Target Corporation has partnered with RedBrick Health to pilot a wellness program that includes health advocates who are available to assist employees with all health-related issues. The pilot program was designed to ensure team members get the most out of the health and wellness programs offered through Target. Health advocates are available to support pilot program participants with any health-related issue, including benefits and associated claims, identification of the appropriate medical care, health coaching and use of online tools to get and stay healthy. Target also provides cash incentives for eligible pilot program participants who complete biometric screenings, health assessment questionnaires, preventive care visits and recommended coaching programs that are intended to help team members reach their personal health goals. Target's wellness resources include a toll-free NurseLine open 24 hours a day, seven days a week to help determine the appropriate level of care; a new Target health & wellness Web site that provides online health coaches, a personal health record, a health risk assessment and information from leading industry experts on a variety of health topics; and a variety of other resources including an Employee Assistance program, onsite clinics, discounts for many national fitness center memberships and discount Weight Watchers programs. Target is also planning to pilot a comprehensive online tool, MD Health Evolution, as part of a greater initiative in 2009 to further help team members get and stay healthy. The easy-to-use educational tool will be free for pilot team members (plus one friend) and is designed to assist them in assessing their current health, learning how to improve their fitness and nutritional habits, and tracking their progress. — Susan Butterworth, Ph.D., director of health management services at Oregon Health & Science University. Get more information on coaching in the healthcare continuum. Motivated by the rising number of young people being treated for what were once considered “adult diseases," Health Net of California, Inc. is building comprehensive education programs to address childhood and family obesity and weight management. One program, "Fit Families for Life," offers a five-week, in-home program for the whole family that employs innovative approaches to childhood and family weight management issues. The program encompasses numerous nutrition and physical activity topics and is available to Health Net Medi-Cal, Healthy Families, Healthy Kids and Access for Infants and Mothers members throughout California. This home-based program will be expanded to the public through a series of community classes in which enrollment and materials will be offered at no charge. In addition, Health Net members with high BMI levels also are eligible for a new personalized, telephone-based Fit Families for Life coaching program. Another program, Decision PowerSM is a weight management program that provides free Web-based educational modules, plus one-on-one, telephone-based access to individual health coaches who can provide information and motivation to help members better manage their weight. American Health Holdings relies on the Patient Activation Measure to assesses a patient’s level of engagement in their own overall health management, but it does more than just that. PAM scores are also used to gauge the success of the DM program and its coaches. Director of DM and Wellness Services Diane Bellard discusses PAM — who is using it, how to deal with a decrease in PAM levels, how it fits with a patient's readiness to change and PAM's role in an organization's overall quality improvement. Question: How do you stratify individuals into the coaching programs based on their HRA data? Response: (Gregg Lehman) There’s a science-based algorithm that goes through a decision-tree type of questioning in the HRA question sets. From that, you could stratify low, moderate or high risk. When we marry that with biometric data, we can also determine the risk stratification and more importantly eligibility for participation in one of the intervention programs. 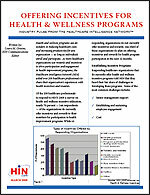 Get more information on employee health promotion strategies. In "The Next Generation of Health Coaching: Multi-Platform Models for Sustained Behavior Change," health coaching veterans set the stage for Health Coaching 3.0 and describe the skills, technology and training that will be required to equip health coaches for this eventuality. To optimize program success and ROI, health coaching will need to be powered by multi-channel outreach — land lines, Web, email, cell phones and even PDAs — and reinforced by tightly interwoven communication and incentive programs. Get more information on health coaching 3.0. Health and wellness programs can do wonders in reducing healthcare costs and increasing productivity for any organization — as long as individuals enroll and participate. As more healthcare organizations use rewards and incentives to drive participation and engagement in health improvement programs, HIN asked over 200 healthcare professionals to share their organization’s experiences with health incentives and rewards. Download complimentary white paper here. Please pass this along to any of your colleagues or, better yet, have them sign up to receive their own copy at http://www.hin.com/freenews2.html where you can also learn about our other complimentary news services. Submit your question for the HealthCoach Huddle to editor@hin.com. There are other free email newsletters available from HIN! Healthcare Quality Improvement Briefings is a free weekly email newsletter for healthcare professionals seeking up-to-date news and information on healthcare quality improvement initiatives in health plans and hospitals. This free newsletter gives you news about new quality improvement programs, links to sample sites posting healthcare report cards and reviews of new information resources on quality improvement. Fax (732) 292-3073; e-mail info@hin.com, Web site www.hin.com.